A few weeks ago we packed up our Hiace van with a tent and food and our kids. We headed east from Perth, first to Kalgoorlie and then further east and north through the Western desert, and on to the Northern Territory and Alice Springs. It was a wonderful journey, not without it’s challenges, but very worthwhile. It is too much to try and write it down all in one shot, so perhaps over time I’ll record some bits and pieces. They are not in any order or around any particular themes, just thoughts and ideas and memories I had along they way. Sometimes I wrote them down, or just filed them away in my mind for later. Part of the reason for the journey was to revisit Tjukurla, a remote community in the Ngaanyatjarra lands, where we lived over a decade ago. The Ngaanyatjarra lands are in the central eastern part of Western Australia, include parts of the Gibson, Great Sandy and Victoria deserts and cover over 250 000 square kilometres (about 3% of mainland Australia). 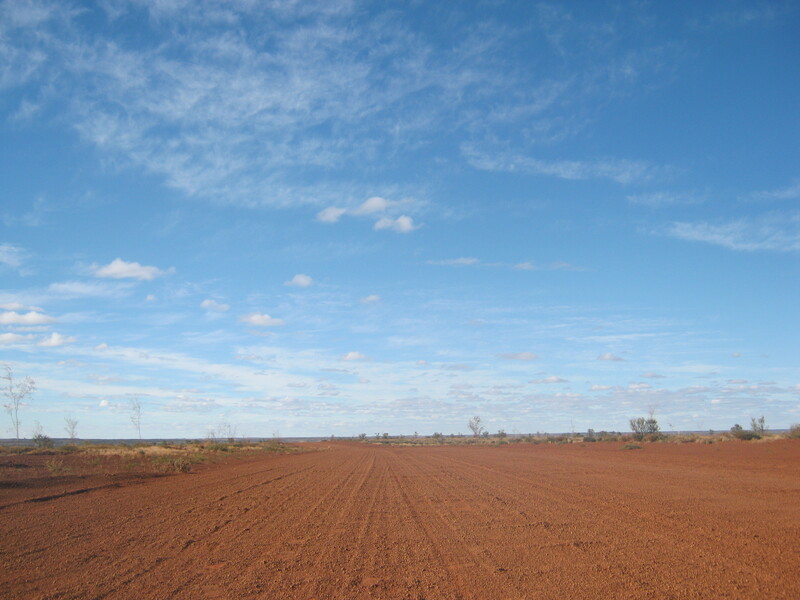 The lands include the communities of Tjukurla, Warakurna, Mirlirrtjarra (Warburton Ranges), and many others. It is striking country – dirt tracks stretching to wide horizons, ranges and desert oaks and rock-holes, stark blues and reds and golds. The kids at the school where we taught are all grown now, and many of them have children of their own. One of the golden moments of our journey was coming across a group of ladies on the road east of Warakurna. They had car trouble and were doing some hunting while they waited. It turned out that these were Tjukurla folks, and we had a beaut time there by the side of the road, talking and meeting each other’s children, hearing stories of who lived where now, and even joining in the hunt for tirnka (goanna). It was worth the trip just for that. We did lots of ‘preparation’ for our journey, a great deal of it geared around things like spare tyres, food, where we would stay, and making sure the van could go the distance. I did wonder though, whether we were prepared enough in other ways. Among the demands to fit out the van, to tidy up and pack, and find a home for the dog and the chooks, it seemed less urgent to prepare in ways not so tangible. Even though we lived for a time in Ngaanyatjarra country, there is a lifetime’s worth of learning to be done about history and culture and change, and the extended time since we’ve been there means that some of the knowledge and memories have significantly faded. There is a language to learn that makes relating to local folks much more meaningful and respectful. And how might we tune ourselves and our children to the new rhythms of a remote place and people who were part of our past but to whom we’ve been stangers in recent times? None of this works well done in a hurry, and there is no course to do or single text book to read. Perhaps the journey itself is the only preparation. To be truthful, we tried a bit. With the aid of old photos and stories and some language books, we at least made an attempt. But the proportion of time spent preparing ourselves in those ways was far outweighed by the practicalities. It is a note I make to myself for the future – wherever I go are go, close by or far away, the balance and nature of my preparations are worth further attention.